Charlie’s was first established in 1987 known then as The Crown Restaurant & Lounge located in the main floor inside Blondell Motel on 2nd St. across from St. Mary’s hospital. Later, the business name was changed to Charlie’s Eatery & Pub. The Blondell Motel was sold and renamed as The Brentwood. In 2016 The Brentwood was sold to investors, and Charlie’s then moved to Hillcrest Shopping Center. We are proud to serve good American Comfort Food on our menu, homemade soup daily, breakfast, lunch and dinner specials daily, all at a fair price focusing on our local patrons. 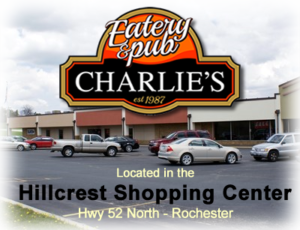 Charlie’s Eatery & Pub is available for all your catering needs, from casual gatherings to formal occasions! We can offer onsite venue for your events, or we will bring the delicious food to your location. We can also provide a complete, fully licensed, beverage bar with spirits, wine and beer.